Written by the chair of the LEED-Neighborhood Development (LEED-ND) initiative, Sustainable Urbanism: Urban Design with Nature is both an urgent call to action and a comprehensive introduction to "sustainable urbanism"--the emerging and growing design reform movement that combines the creation and enhancement of walkable and diverse places with the need to build high-performance infrastructure and buildings. 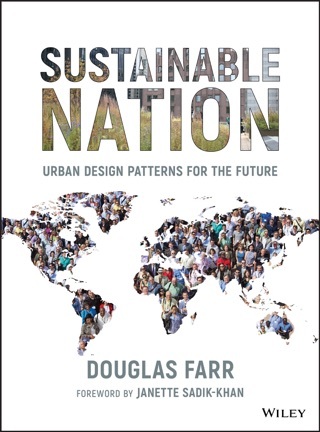 Providing a historic perspective on the standards and regulations that got us to where we are today in terms of urban lifestyle and attempts at reform, Douglas Farr makes a powerful case for sustainable urbanism, showing where we went wrong, and where we need to go. He then explains how to implement sustainable urbanism through leadership and communication in cities, communities, and neighborhoods. 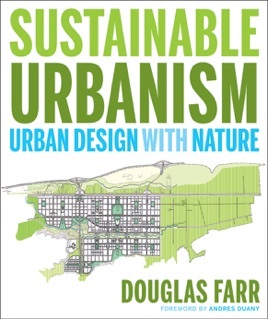 Essays written by Farr and others delve into such issues as: Increasing sustainability through density. Integrating transportation and land use. Creating sustainable neighborhoods, including housing, car-free areas, locally-owned stores, walkable neighborhoods, and universal accessibility. The health and environmental benefits of linking humans to nature, including walk-to open spaces, neighborhood stormwater systems and waste treatment, and food production. High performance buildings and district energy systems. Enriching the argument are in-depth case studies in sustainable urbanism, from BedZED in London, England and Newington in Sydney, Australia, to New Railroad Square in Santa Rosa, California and Dongtan, Shanghai, China. An epilogue looks to the future of sustainable urbanism over the next 200 years. At once solidly researched and passionately argued, Sustainable Urbanism is the ideal guidebook for urban designers, planners, and architects who are eager to make a positive impact on our--and our descendants'--buildings, cities, and lives.